The other day, I took out a Boris Bike for the first time. 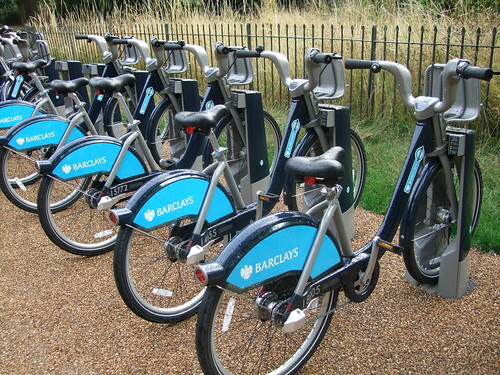 This is for the London Cycle Hire scheme. The scheme is designed for short hops of less than half an hour. An occasional user pays £1 a day for access (the clock starts on first use, it's 24 hours, it doesn't reset at midnight). If you're in London every day, then £45 per year is a better bet. After that, journeys of less than 30 minutes are free. The costs rise sharply, so it's a good idea to dock at 25 minutes and change bikes. Until the end of august you will need to pre-register and get a key (costing a few pounds), after that a credit card can be used. Personally, I was always going to opt for the key, so much more convenient. As I'm an occasional visitor to London, I've got a key, set up to charge £1 access fee with auto-renewal. The bikes are 'sit-up and beg' bikes. They're pretty heavy - but they're made for robustness, not as speed machines. To get one is simple. Find a dock (you are sent a map of existing docks with the key) and then choose a bike. Stick the key in the hole, the light goes green and pull the bike out. Ride. When arriving at the destination just push the bike into the dock - and ensure that the indicator light says it has been docked correctly (this is important, as the fine for losing a bike is large). An online map of the scheme is available, unfortunately there doesn't seem to be a link (as I write) to a pdf of the leaflet they send out, this is much more comfortable for paper use (though would admittedly need some work to be suitable for home printing). I can't see a link to request a new paper map, either. The bikes have hub gears, and felt very smooth, though the brakes aren't strong. The lights are dynamo driven from the front wheel and stay on for some time after motion has stopped. The hub gears were good, though I found the gear choices odd. First gear was far too low, gear 2 and 3 were fine... but gear 3 didn't go high enough. I'd had changed all the ratios up a bit (making the current gear 2 the lowest gear). I took two bikes, one was a circular trip inside Kensington Gardens, the other was from Park Lane to Waterloo. I really liked that - it was a cool evening. I had been for a meal at Queensway, and planned to cycle back to the train. Being inside Kensington Gardens, the gate was locked and the bikes were inaccessible. Doh! This is why I picked up a bike from Park Lane. What was going on here? Only that last entry was correct - my trip from Park Lane was missing, and it looked liked I'd been charged 90 quid?! On the dates in question, I was nowhere near London (the 17th is provable, we had gone for a meal, as it was our 8th anniversary). I checked back a few minutes later and it had sorted itself out. All is now as it should be, but it does indicate that the IT behind this system is a little flakey. It'll need keeping an eye on. That 90 quid shock to the system aside, I thought it was a really good scheme, though Monica found that the saddle was a little too high for her, she'd be okay once more comfortable on a bike. The bikes were pretty smooth rides - and the docking stations are pretty convenient for places I need to get to (though I can see gaps on the map). It could be improved by having the dock suggest a cycle-friendly route from A to B - but I can see that this isn't a priority.